Adding some fruit trees to your yard might add a touch of beauty–and delicious fruit! Fruit trees are a beautiful way to accent your yard and have a tangible benefit at the end of the season! If you are curious about adding fruit trees to your landscaping, here is what you need to know before getting started. Fruit trees can be planted from seed, but that will take much longer to yield any tangible results. Fruit tree seeds also do not often provide a very tasty result. They are great at providing a nice tree, but less awesome at giving you delicious fruit. Instead, you should purchase a bare fruit root tree that has already undergone the grafting process. 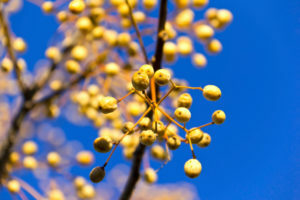 These trees can be purchased in the late winter (February or later) at Maryland nurseries. Fruit trees thrive in sunny areas, so you should place them in a portion of your yard that receives a good deal of uninterrupted sunlight. There should not be other plants in the immediate area, or your fruit tree might block them out and take nutrients and water from them (or lose out to what is already there). Keep in mind that the bare fruit root tree you are planting today will grow into a full sized tree over time. Fruit trees seem like relatively straightforward plants, but that isn’t always the case. You should always take the time to research fruit trees before adding them to your yard. As a general rule of thumb, fruit trees need at least 6 hours of sunlight every day to grow in healthy and robust. There should not be any other plants in the immediate surrounding area. Always research the full size of the tree before adding it to your yard. This entry was posted on Friday, November 10th, 2017 at 2:34 pm. Both comments and pings are currently closed.